'A hopeful book about the potential for human progress when we work off facts rather than our inherent biases.' BARACK OBAMA The perfect Christmas gift: a message of hope for our troubled times. *the #1 Sunday Times bestseller * instant New York Times bestseller * an Observer 'best brainy book of the decade' * #1 Wall Street Journal bestseller * Irish Times bestseller * Audio bestseller * Guardian bestseller * ---Longlisted for the 2018 Financial Times/McKinsey Business Book of the Year--- 'One of the most important books I've ever read - an indispensable guide to thinking clearly about the world.' BILL GATES 'Hans Rosling tells the story of "the secret silent miracle of human progress" as only he can. But Factfulness does much more than that. It also explains why progress is so often secret and silent and teaches readers how to see it clearly.' MELINDA GATES Factfulness: The stress-reducing habit of only carrying opinions for which you have strong supporting facts. When asked simple questions about global trends - why the world's population is increasing; how many young women go to school; how many of us live in poverty - we systematically get the answers wrong. So wrong that a chimpanzee choosing answers at random will consistently outguess journalists, Nobel laureates, and investment bankers. 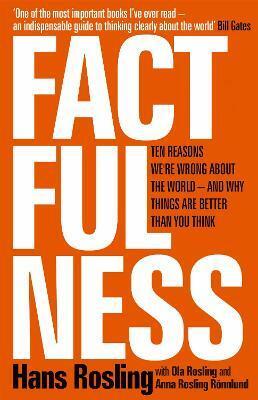 In Factfulness, Professor of International Health and a man who can make data sing, Hans Rosling, together with his two long-time collaborators Anna and Ola, offers a radical new explanation of why this happens, and reveals the ten instincts that distort our perspective. It turns out that the world, for all its imperfections, is in a much better state than we might think. But when we worry about everything all the time instead of embracing a worldview based on facts, we can lose our ability to focus on the things that threaten us most. Inspiring and revelatory, filled with lively anecdotes and moving stories, Factfulness is an urgent and essential book that will change the way you see the world. Hans Rosling was a medical doctor, professor of international health and renowned public educator. He was an adviser to the World Health Organization and UNICEF, and co-founded Medecins sans Frontieres in Sweden and the Gapminder Foundation. His TED talks have been viewed more than 35 million times, and he was listed as one of Time Magazine's 100 most influential people in the world. Hans died in 2017, having devoted the last years of his life to writing this book. Ola Rosling and Anna Rosling Roennlund, Hans's son and daughter-in-law, were co-founders of the Gapminder Foundation, and Ola its director from 2005 to 2007 and from 2010 to the present day. After Google acquired the bubble-chart tool called Trendalyzer, invented and designed by Anna and Ola, Ola became head of Google's Public Data Team and Anna the team's senior user experience (UX) designer. They have both received international awards for their work.